Tomatoes belong to the nightshade family and are closely related to chili peppers, potatoes and eggplants. They are native to Central, South, and southern North America. While tomatoes are a perennial plant and are often grown outdoors in temperate climates as an annual, many varieties are now also grown in greenhouses more locally. Roma tomatoes (also called plum tomatoes) are a thicker-skinned and less-pulpy variety which tend to hold their shape better than other tomatoes. Just one medium sized tomato provides about one half of the recommended daily allowance for vitamin C and approximately 20 percent of the recommended daily allowance for vitamin A. These delicious fruits are a good source of potassium, which helps to maintain a healthy blood pressure. Tomatoes are also low in fat and sodium, and they are an excellent source of lycopene, a powerful antioxidant that can help reduce the risk of some cancers. Pick tomatoes that are firm, red and heavy for their size. Since colder temperatures kill the flavour of a tomato, it is important not to store them in the refrigerator. 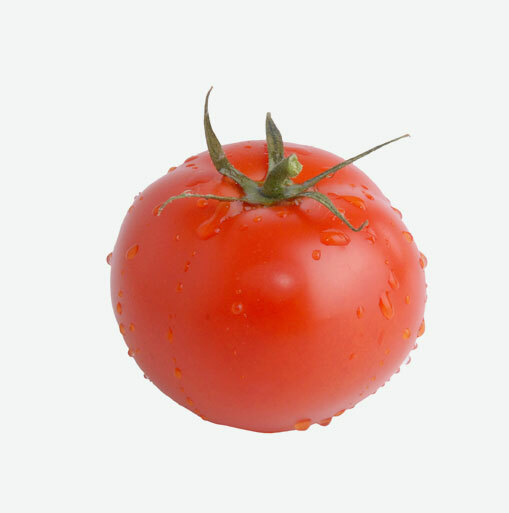 Once a tomato has been cut, however, it is best to store it in the refrigerator. Before using the tomato, wash them first, then peel, seed or pare them depending on how you will be using them. Fresh tomatoes can make a great addition to salads, sandwiches, or can be served as an appetizer. Cooked tomatoes can be stuffed, used in soups, omelets, and stews. They can also be used as the base ingredient in preparing fresh pasta sauces, pizza sauce, or marinades. Using a sharp paring knife, make several angled cuts through the stem and under the core. Place the tomato on its side and halve with a sharp serrated knife. Squeeze each half firmly enough to push out the seeds. First core the tomato and then place it on its side. Using a sharp serrated knife, cut a very thin slice off both ends and discard. Slice the tomato to desired thickness. These tomatoes are great for eating fresh or cooked in a zesty Italian tomato sauce. Plum tomatoes have a fine thick flesh and less amounts of pulp than other varieties of tomatoes which help them to cook down faster than other tomatoes when cooking sauces. These delicious fruits hold their shape well which also makes them good for canning. Beefsteaks are the no. 1 slicing tomato for sandwiches and salads. They are large in size and they have a marbled appearance of a steak, hence their name; beefsteak tomatoes. These tomatoes hold well together when sliced and this also suits them to cooking. Beefsteaks have a juicy firm flesh and can be very sweet when ripe. Yellow tomatoes make a great salad tomato. They are juicy, sweet and you can eat them fresh out of hand. Yellow tomatoes can also be sectioned and served with a drizzle of balsamic vinegar and extra virgin olive oil with chopped fresh basil to make a salad all its own. These are the classic Italian tomatoes used for making tomato sauce and tomato paste. San Marzanos are all flesh or meat and with hardly any seeds. These tomatoes are heavy and full and make an excellent canning tomato. Cluster tomatoes come in all sizes and colours. A popular description for cluster tomatoes used in stores are “vine-ripened tomatoes” and that is because they are still on the vine. Cluster tomatoes are picked at different stages of ripeness, depending on the specific variety. They are mainly used in salads but can be added to other dishes. Tomatoes belong to the nightshade family and are closely related to chili peppers, potatoes and eggplants. They are native to Central, South, and southern North America. While tomatoes are a perennial plant and are often grown outdoors in temperate climates as an annual, many varieties are now also grown in greenhouses more locally. Roma tomatoes (also called plum tomatoes) are a thicker-skinned, more-pulpy and less juicy variety which tend to hold their shape better than other tomatoes. These tomatoes are a much smaller variety of the regular tomato. They range in size from a thumb tip up to the size of a golf ball. These colourful tomatoes make great snacks and are an excellent addition to salads. Cherry tomatoes are sweeter than the standard tomatoes. Campari tomatoes are cocktail sized and deep red in colour. They have a light skin and a luscious, juicy flesh. They offer a pop-in-your-mouth sweet succulence that makes them just the right tomato for salad, bruschetta, pizza and salsa. Ripe tomatoes which are placed in the sun to remove most of their water content or are placed in a dehydrator are called “sun-dried” tomatoes. Twenty pounds of fresh, ripe tomatoes will dry down to just one pound of sun-dried tomatoes. Sun dried tomatoes have the same nutritional value as the fresh tomatoes they are made from: they are high in lycopene, antioxidants, vitamin C and low in sodium, fat, and calories.